Having lived in Australia for over four years; one might assume I'd gotten over the giddy joys of spotting a kangaroo in the wild. One might be wrong. I'm not sure what it is about the bouncy creatures that fascinates me, but I honestly never tire of spotting these gorgeous animals in the wild. What's more, I've passed this love of kangaroo spotting onto my toddler son who now happily chants, 'boing boing kangaroo' whenever we spot one of nature's finest jumping mammals. So, if like me you enjoy spotting Kangaroos when you're out and about, what great spots have you come across? Here are a few of my favourite kangaroo viewing spots. Based in Perth's far north, Yanchep National Park is a beautiful area; just perfect for wildlife spotting area. Not only is it home to families of spritely kangaroos but you can also spot some cuddly koalas. Take a walk near the lake and we've always been able to spot the kangaroos in the ferns and bushes. They're most active at dusk and dawn but you'll catch them seeking shade here in the heat of the day. Take a picnic and make a day of it at this park with so much to offer the family. Whenever I take a drive through the Chittering Valley area at dusk, I can't help but spot a volume of kangaroos in the near vicinity. You'll notice them in the fields and valleys, in addition to getting perilously close to the side of the road; so driving with caution here at twilight is a must. If you need some pointers for where to head to, try Jaldary Trail, off Smith Road in Bullsbrook. You can park your car up and look out at a vista filled with jumping kangaroos. Dusk is the best time to capture kangaroos at this spot. 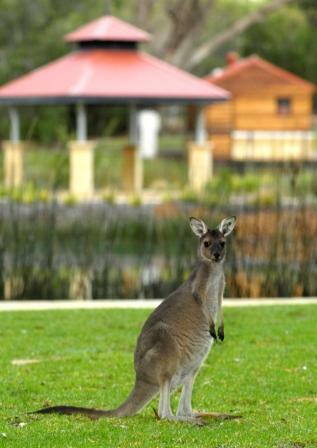 This golfing resort, like many other golfing estates seems to attract kangaroos by the boat load. Take a walk around the estate and there are hundreds to be seen. I've spotted them here at all sorts of time of day, and they are an active bunch to say the least. If the Vines isn't too near to you, then check out your local golf course. There's something about the plush green grass that has kangaroos simply flocking to it. Wanneroo Golf Course and Joondalup Golf Course are two such examples that have some regular dusk time kangaroo visitors. This well kept cemetery for many is a sanctuary of peace and contemplation. However, its beauty and lush grounds have also attracted visitors in the shape of joggers, families, picnic goers and of course the native kangaroo. If you are taking children with you, and you're not visiting the actual cemetery, then stick to the beautiful gardens away from the grave stones to avoid causing disruption to those seeking private solitude. This is a beautiful spot to take the family to see a plenitude of kangaroos and is easily accessible just off Whitfords Avenue. Are there any other spots that you've come across; here at Weekend Notes, we'd love to hear from you. If you've not managed to spot a kangaroo in the wild yet, or if you want to get a little bit closer to the kangaroo action, you can always visit one of the wildlife parks that cater for those wanting to feed or greet a tame kangaroo in person. A popular choice for this is where you can wander through the kangaroo enclosure and feed the Kangaroos at your leisure. Caversham is also a great spot to meet other Australian native animals including the wonderfully fluffy and cute koala and the sleepy wombat. This is a great morning or afternoon out if you've got small children with you or visitors to Australia. Araluen gold club, anywhere along Heritage Drive is good. We have kangaroos that jump around the park and roads at the bottom on Port Kennedy every evening round the golf course and sand dunes. behind channel 10 off Mirrabooka Drive! Byford, large vacant paddock, right in the centre of the town, heaps there every afternoon/evening and often during the day when cool as well. 10 minutes south of Armadale and Cohunu Wildlife Park is just 2 mins down the road from there. We also have kangaroos roaming Heirisson Island, right on the causeway bridge. The South Perth side of the island has a colony of kangaroos who are quite tame. It is a beautiful tranquil island where children can run around freely and safely. There is plenty of natural vegetation also, so you can't even hear the city traffic. On the corner of Whitfords Ave and Duffy Terrace in Woodvale. you have to be careful driving all the way down Duffy Tce sometimes at night because they can be roaming along the road. I think the best place is to see them in john forest national park at the back of the pub/eating house there. It's where they live and they are fed, everytime we have gone they have been there, loads of them and the lady gave us some food and they fed from our hands. Go for some food or a drink there, pretty basic place but you get to see the kangaroos for free, entry charges for the NP. pinnaroo cemetery has loads of kangaroos! its a beautiful spot, just off whitfords ave, hillarys. Somewhere closer to the city is Pinneroo Cemetery. Lots of them there and always on view. Rockingham golf course, many kangaroos and can be seen from the car park. Also the stretch of bush from Safety bay road overpass that connects Ennis avenue down to the roundabout on old Mandurah road, opposite the salt lakes....you should see many. Apart from The Vines Resort We always take our visitors to the hills above Brigadoon.Turn off The Great eastern H'Way into Cathederal Ave and turn right just after the little Fire Station on the right.Going straight ahead would take you down to Bells Rapids.Slowly driving the circuit at dusk,preferrably just prior actually.Kangaroos are unpredictable with traffic.These are in their natural environment and it is fun to observe them creeping into the open from beneath the treeline.Be calm and patient and you will see Joeys climbing out of mums pouch to nibble the grass and often a bit of boxing too.Good spotting.Brenda. John Forest National Park is another Kanagroo spot. There are lots of bushwalking trails, so while you're wandering along, keep your ears peeled for the tell tale sound of Skippy bounding along. Pinneroo Cemetery. There are 50 to 100 kangaroos that live there. They graze on the open grassed areas of the Cemetery and you don't have to look far to see them in groups. Either walk through the Cemetery or drive around the roads. But leave dogs at home. They will retreat into the bush areas if they see a dog. Closer to town you can see kangaroos on the south end of Heirisson Island.